It is a relief that Indonesia arrested 11 would-be terrorists recently before they could go ahead with their intention of attacking the Singapore Embassy in Jakarta, but disquietude remains. Singaporeans owe gratitude to the Indonesian anti-terrorism agency for its vigilance and timely action. It has prevented what could have been a horrific loss of innocent lives. 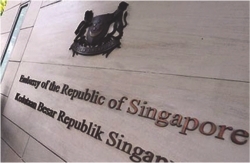 Captured together with small arms and a machine gun, the suspects revealed that they had wanted to pick off Singaporeans coming out of the chancery. Along with other nationals, Singaporeans have long faced terrorism threats in this age of global terrorism. Recent attacks have drawn Singaporean blood, but still it is chilling to learn that they were being targeted so specifically and in such a cold-blooded manner. Just as disturbing is that the risks are likely to mount as Indonesia continues its counter-terrorism operations. The apprehension or elimination of top Jemaah Islamiah (JI) and other leaders has helped to fracture major terrorist networks. Splinter groups, acting without any over-riding strategy or broad leadership and even less concern for building public support, are ready to hit out even more indiscriminately. So, paradoxically, anti-terrorism success has heightened dangers. Singaporeans should pay close attention to authoritative alerts and warnings. It is best to exercise caution. According to investigators, the suspects now in custody said they targeted Singapore because 'Singapore is close to Israel' and therefore 'an enemy'. In truth, terrorists do not seem to need any reason to attack anyone. So wanton are their violent acts that any excuse they give is no more than propaganda. The loss of strategic coherence and leadership may have weakened terrorist groups, but it also poses a challenge in any attempt to move decisively against their remnants. Indonesia disclosed last week that it is planning to extradite from Pakistan and prosecute its most wanted terrorist, Umar Patek, implicated in the 2002 Bali bombings that killed 202 people and damaged the country's tourism trade. But it has to weigh the risk of inadvertently providing a rallying point for disparate and desperate militants out to wreak death and destruction. Leaving it to another country, such as Australia or the United States, to bring Patek to justice, however, also presents Jakarta with a dilemma. Its anti-terrorism efforts would be seen as nothing more than doing the bidding of Western interests. Growing in complexity, the war on terror must, in fact, involve sensitivity to and coordination with partners at all levels, from local authorities to national governments and international institutions. Only then can deterrence, vigilance, enforcement and justice be effectively exercised - and the contest eventually won.